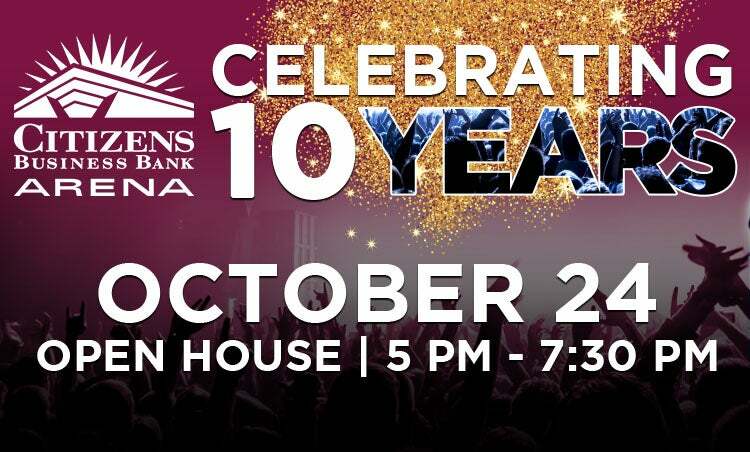 Citizens Business Bank Arena invites the community to celebrate 10 Years! The first 100 people to enter the doors on October 24th at 5:00pm will receive a swag bag. Each attendee can pick up a tour card for the opportunity to visit all five concession stands for a taste of the new menu items plus a visit to the San Manuel Club, a private space reserved for Premium Seating guests only. In addition to the music, contests, and tasty treats the home teams and partners of the Arena have been invited to join the fun with activation stations. Known as the Entertainment Icon of the Inland Empire, Citizens Business Bank Arena has been the community’s home for sporting competitions, family shows, and concerts for 10 years. Be sure to stop by and have your complimentary photo taken for the scoreboard - a selfie opportunity! The ice will be down so wear your jackets and enjoy touring the arena with your family, friends, and business associates.Ticket giveaways plus 10 Full Sports Package Club Seats for 2 will be awarded.Parking is free, please use the main entrance.For more information on the event and all upcoming shows at Citizens Business Bank Arena please visit our website at CBBankArena.com. Citizens Business Bank Arena, built and owned by the City of Ontario, includes 9,500 fixed seats with additional “portable” seating risers to accommodate capacities of 11,089 for concerts, 9,736 for ice hockey or arena football and 10,832 for basketball. The 225,000 square foot venue features 36 luxury suites located on two levels and a continuous concourse hosting a variety of refreshment stands, merchandise kiosks, a VIP club and other fan amenities. Citizens Business Bank Arena hosts ice hockey, soccer, and a variety of other sporting competitions, concerts, family shows, special events, conventions, school and community activities as well as private events. The Arena is home to Ontario Reign, an AHL Hockey Team, and Ontario Fury, a MASL Soccer Team. Citizens Business Bank Arena is the biggest and most modern arena within the Inland Empire, an area with over 4.2 million people. It is located in the City of Ontario, California, on a 37-acre parcel located between Haven Avenue and Milliken Avenue, Fourth Street and the I-10 Freeway. For more information visit CBBankArena.com.